The Canon OC-E3 Off-Camera Shoe Cord connects between your camera's hot shoe and a Speedlite flash so that you can easily fire your flash off-camera from up to 2' away. This is handy for event and documentary photographers who need quick, alternative angles for their flash without a lot of excess cable. It is ideal for run-and-gun style hand-held flash firing off-axis from your camera. It pairs well with the Custom Brackets PRO-E Camera Rotation Bracket with Universal Camera Plate, which is rentatable separately. This cable also eliminates the need for radio triggers, provided that you are fine with firing your off-camera flash from only 2' away, maximum. • This flash cable, in theory, will fire any flash from any camera's hot shoe manually via the center contact point of the cable but experiment at your own risk. 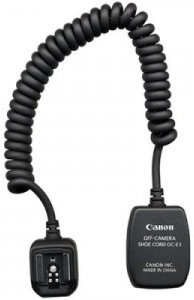 TTL functionality is only capable when using this cable with a Canon camera and a Canon EX Speedlite.